Minnesota is a US state justifiably famous for its northern boreal forests and associated lakes. These wonderful wildernesses are home to many iconic species and this trip, initially pulled together with the help of local photographer and Natures Images guide Stan Tekiela, will focus on two of them. For the lakes part it is the Great Northern Diver as we call them in Europe, but the Common Loon as it’s known here – a bird of a familiar yet haunting call and which will be looking after their young on an array of lakes and using low-level boats we will be able to photograph their parenting at a number of locations. 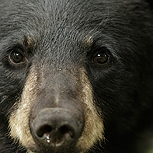 For the forests, it’s the Black Bear and a location where mothers have been bringing their cubs to feed for decades, and with the chance of males on the scene as well, the encounters and photography can be equally spectacular. This unique combination offers a real chance to capture and experience some of the essences of northern US forest wildlife. Day 1: We are due to arrive in at Minneapolis Airport from our chosen connecting flights. We will then transfer to our accommodation in the town of Annandale, Minnesota for our first base for this trip. Over dinner we will discuss what to expect over the coming days photography and meet our local guide Stan Tekiela who is resident in this part of the State. Day 2: It’s an early start as we then make our way for our first encounter with the Great Northern Divers or as they call them here Common Loons. We have timed this trip to coincide with the peak of their nesting season and during the middle of June the parents will be brooding this year’s chicks. We will have two small boats for our daily excursions on to the array of lakes in the area (there are around 25 in just a 5-mile radius) the precise location of which will depend on where the birds are nesting this year. The boats are specially designed, so they give us a low perspective. We will visit many parts of the lakes to visit different breeding pairs, which will give us optimum photo opportunities. We plan to have early morning and late afternoon/evening sessions on each of our days here to work with the best of the light so there will be a chance to rest during the brighter middle parts of the day. Days 3 – 4: The first part of our trip is dedicated to photographing the Divers on their breeding lakes. We will again go out early each morning and then take a break during the middle part of the day. We will also again head out for an afternoon/evening session with these beautiful birds. We will make the most of the best possible light at the optimum times of the day. The breeding pairs will have young chicks at this time and so we will be photographing the adults feeding their young and hopefully get the chance to photograph them resting on their parents’ backs. Day 5: This day will see us transfer to our next location for Black Bears and will be based in the town of Orr in northern Minnesota. We have secured special permits for our group in a sanctuary area deep in the Kabetogoma State Forest area which will allow us to get photographic opportunities of this iconic bear of these northern forests where they have been visiting to feed during the summer months for decades. We are looking to photograph mums with young spring cubs as well as the chance to photograph large males too. 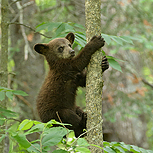 Days 6 – 8: Each day will follow the same pattern as we head out to the forests in search of Black Bears. We will look to be out for the full morning, have a break at lunchtime and then return in the afternoon and photograph through until sunset at approx. 8pm before enjoying a well-earned dinner each night. This location is one of the best for seeing and photographing this otherwise elusive species. Our main goal is to find mothers with young cubs and photograph the interaction between mums and cubs, cubs play fighting, climbing trees. We should also get the chance to see the large males during our stay. Accommodation, transfers to our two bases during the trip, all meals, photographic permits. International flights, alcohol, and sundry items. Accommodation is based on a twin room basis in typical rural style US motel/lodge rooming. It is based on twin sharing but single supplements might be possible on request. The weather can be unpredictable in Minnesota at this time of the year so suitable clothing/footwear is necessary. Walks are not excessive in length. Days will involve early starts and finishes with breaks in the middle of the day though to rest so it can be quite tiring.